The Patmase Villas At Jimbaran is a marvellous club resort situated in Jimbaran Bay on the southern end of the island, a super beach front location with breath taking views to the sea and surrounded by beautiful lush vegetation. It is 30 minutes by car from Kuta, 45 minutes from Denpasar and about a 20-minute drive from Ngurah Rai International Airport. This impressive resort provides the ultimate luxurious accommodation, elegant amenities, and comfortable facilities to guarantee guests, both families and couples, a relaxing and peaceful space in an impressive Balinese atmosphere. "Located in Jimbaran Bay, Bali, the resort is a 15 minute drive from Kuta beach and the Nusa Dua area of the island. The nearest tourist centre and the Uluwatu Temple are 20 minutes' drive away. Ngurah Rai International Airport is 10 kms from the resort. Built in traditional Balinese style, the villas cascade down the terraced hillside, through lush tropical gardens and private courtyards, to the ocean. Each villa has its own courtyard, a secluded garden shower, and a private plunge pool. 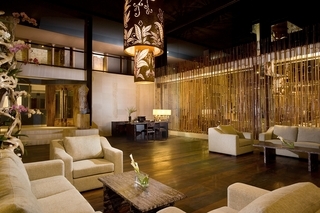 Guests can enjoy a variety of sport and entertainment facilities and can also enjoy the Indonesian spa. There is a sauna, and massage and spa treatments are available. Guests can enjoy dramatic hilltop and ocean side dining. Breakfast, lunch and dinner can be enjoyed à la carte. This resort's villas are exotic, luxurious and inspiring making the guest's stay an unforgettable experience." 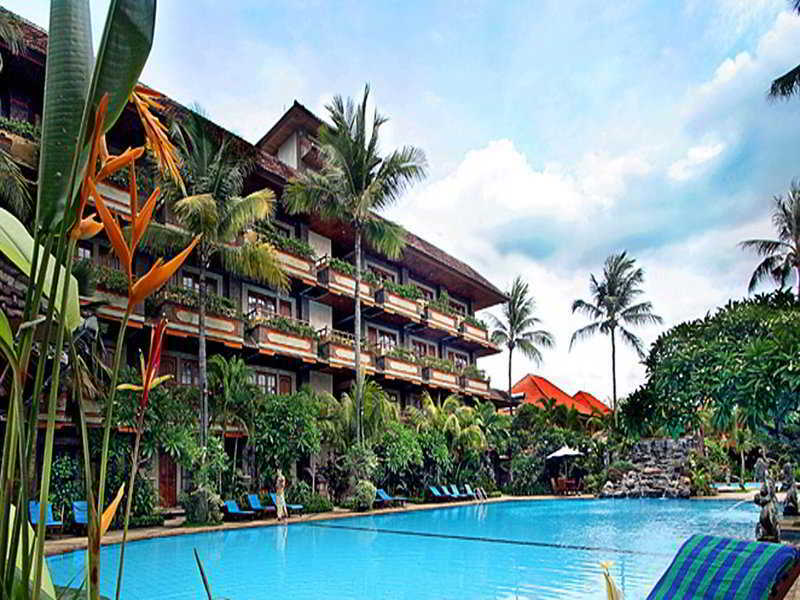 This beach hotel is situated just a short walk from the centre of Jimbaran, on the island of Bali. The establishment is adjacent to the popular Jimbaran beachfront seafood market and is within a short drive of Garuda Wisnu Kencana and the Pura Uluwatu temple. Denpasar, the capital of Bali, can be reached in around 25 minutes by car, whilst Ngurah Rai International Airport is approximately 5 km from the accommodation. This property is unique in design, and has been inspired by a Balinese palace. It combines a tropical garden landscape and an intimate atmosphere with a wide range of amenities, ensuring guests will experience an unforgettable stay. 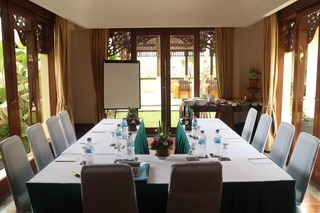 This hotel enjoys a strategic setting in Bukit Jimbaran, lying just a 5 minutes' driving distance from Garuda Wisnu Kencana Cultural Park. 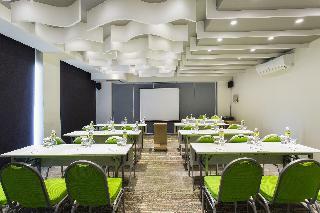 The hotel is situated just a 20 minutes' driving distance from Bali International Airport. Guests will find themselves just a short distance away from Dreamland and Jimbaran Beach, as well as a host of dining options, entertainment venues and shopping opportunities. The hotel enjoys a stylish design, exuding elegance and poise. The guest rooms are exquisitely appointed, featuring refreshing tones and a relaxing ambience. The rooms are well equipped with modern amenities, for added comfort and convenience. Guests are invited to take advantage of the host of facilities and services that this wonderful hotel has to offer. InterContinental Bali Resort is 1 minute walk from the beach. This property is situated along Jimbaran Bay, just 10 minutes' drive from Ngurah Rai International Airport. The Uluwatu Temple is 16 km from the resort, while New Kuta Golf Course is 10.6 km away. Breakfast buffet and pizzas are offered at Jimbaran Gardens Restaurant, which features open-air seating and live entertainment. 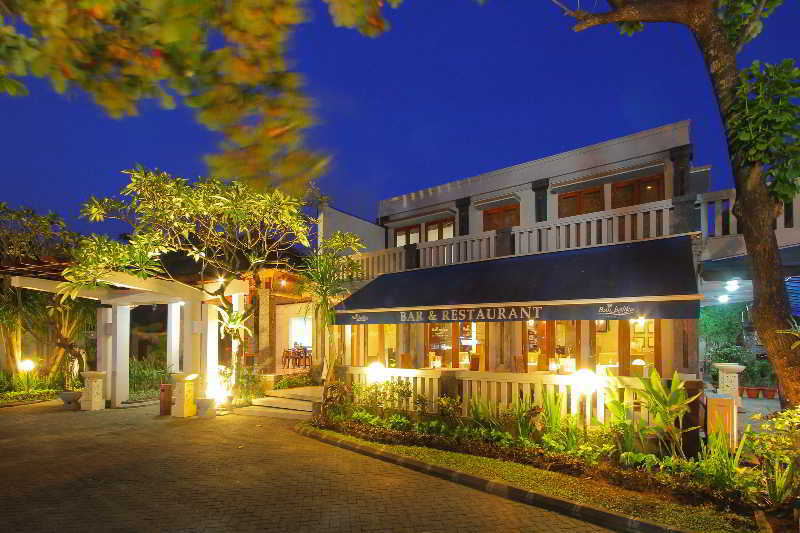 The hotel is a 5-minute walk from Jimbaran Seafood Café.
. The resort is located in Jimbaran Beach. The airports and Denspasar city centre are like 15 min away. The white sandy beach and the hotel are separated by a road, along which there are local seafood cafes. It has superior, deluxe, executive suites, as well as deluxe suites, presidential suites, penthouses and villas. The inviting lobby welcomes with a 24-hour reception, currency exchange facilities and laundry and dry cleaning are also available. The hotel has meeting rooms, parking facilities and shop, as well as hairdresser's and playground for younger guests. Rooms come with all modern conveniences, including a balcony, en suite bathroom with shower and bath tub and double beds. They are fully - equipped and have individually adjustable air-conditioning. Pools, spa and treatments are provided, chess, darts and pool. Nusa Dua golf course is a 30 min drive away. 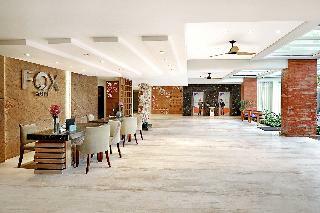 This complex is located in Jimbaran, lying just a 5 minutes' walking distance from the beach. The shops of Kuta and the beach are within a short driving distance away. Guests will find themselves in a prime setting from which to explore the rich heritage and traditions of this wonderful area. This charming complex is situated just 15 km from Uluwatu Temple and a 10 minutes' driving distance from Ngurah Rai International Airport. This hotel opens guests' eyes to the true heights of luxury. The accommodation units are stylishly designed, showcasing architectural splendour. The units feature elements of Balinese design, and are well equipped with modern amenities. This complex affords guests a wide range of exemplary facilities, ensuring a truly relaxing experience. The Sintesa Jimbaran Bali, 206 beautiful appointed guestrooms and suites are available in unique tiers of accommodation which include Superior Room, Deluxe Room, Family Rooms and our Suites Collection. All room categories embody the finest attributes of contemporary Balinese and Javanese design and ultimately anticipate the needs of all our local & international travelers. This collection of accommodation provides the ultimate in crafted comfort, preferential services and privileges. With a prime location close to a large white sandy beach of Jimbaran Bay, one of the best beaches in Bali, these luxurious villas are set amid landscaped gardens dotted with tropical foliage and lush gardens. Located just 10 kilometres from Denpasar International Airport, this is the ideal place to escape from everyday routine and immerse into tranquil tropical Bali beach life. An elegant and cosy atmosphere as well as highly dedicated and personalised service awaits guests in this state-of-the-art accommodation. This establishment offers a choice of villas to suit all clients' needs, ranging from one bedroom to three bedroom pool villas. They all come with a stunning gazebo and living area with kitchenette, among other top-class services. Offering both delicious and healthy food, the restaurants offer a wide range of local and international dishes. Staff were always friendly and there to help. Good location central to everything we needed.